Here is how to grill this fruit that is 92 % water. Barbequed watermelon makes a great summer dessert idea. 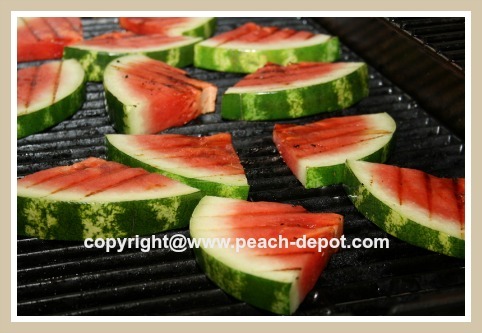 Grilled watermelon can also be served as a side dish along with ribs, chicken or shrimp. And you thought this thirst quencher was only meant to be eaten fresh for dessert? 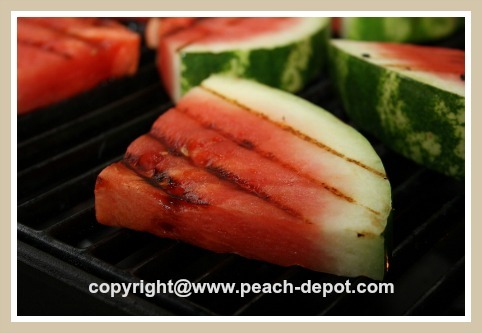 Surprise your family and friends with tasty, healthy watermelon, prepared on your bbq! Watermelon is low in calories too! A serving of watermelon equal to 2 cups of fruit contains only 100 calories, and a lot of vitamins and antioxidants too. Grilling watermelon wedges pulls out the sweetness of the fruit, caramelizes the natural sugars, and produces the wonderful flavour and aroma of warm fruit. I am not sure about you, but I always had trouble choosing a ripe watermelon, and always ended up "taking a chance" that the one I chose was indeed ripe. 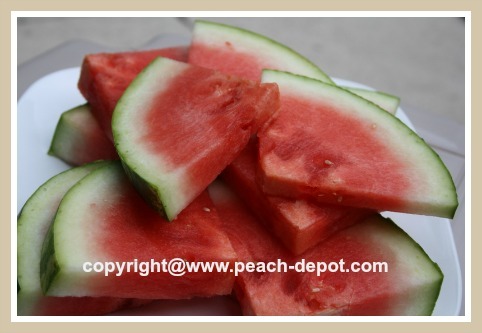 Watermelon does not ripen at all after it is harvested, so it is important to pick a watermelon that has been allowed to mature on the plant. 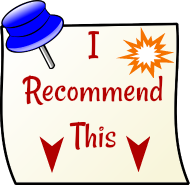 No one likes to cut open a melon, and discover that it is not ripe, red and sweet, but rather dull and bland tasting. I researched this question, and now I know, and have been quite successful! Preheat or prepare the grill for medium - high heat. Prepare the watermelon for grilling by slicing about 1" thick slices crosswise. Cut each crosswise slice in half, and then in half again. This will make 4 wedges per slice. 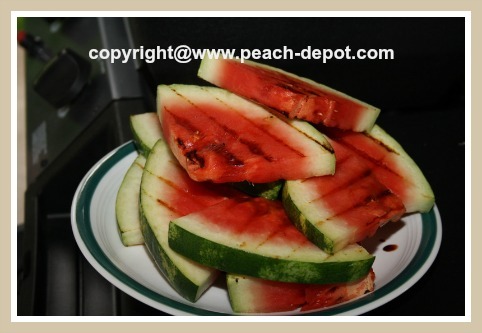 Since watermelon is made up of mostly water, you do not need to add any coating to the watermelon wedges. Leave the rind intact. 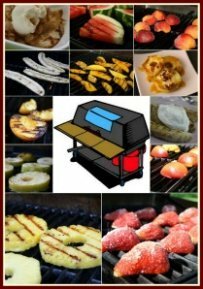 Removing it will make it too difficult to handle the fruit on the grill, causing it to slip through the grate. Grill wedges for about 1 - 2 minutes on medium-high heat, or until grill marks appear, and then turn slices over, and grill for another 1 or 2 minutes. You will notice the sweet smell of the grilled fruit. Remove wedges from heat, and serve. Grill watermelon wedges as directed above. After removing watermelon pieces from the grill, drizzle wedges with some balsamic glaze, fresh feta cheese and fresh basil. A refillable oil spray container is a great kitchen aid when grilling fruit, adding oil to a leafy green salad, and more!